The Purple Agency: What can Digital Tools do for Pharma Marketing? What can Digital Tools do for Pharma Marketing? Digital tools and techniques have changed the face of marketing over the last decade, bringing new and innovative ways to communicate with customers. This digital revolution has reached the pharmaceutical and healthcare sectors in recent years, and digital marketing is fast becoming a crucial part of future strategies and annual budgets. With this in mind, I thought I’d talk to our healthcare experts about digital marketing in the pharmaceutical industry and how these techniques are making a difference. The pharmaceutical industry is not unique in having to evolve and respond to the increasingly online, and increasingly demanding consumer by adopting new digital marketing techniques. These have transformed healthcare marketing and allowed companies to communicate with their tech –savvy customers across a range of channels that they already use, such as social media and mobile apps. These multichannel marketing opportunities enable pharma companies to reach their customers and deliver valuable information across multiple touchpoints. Also, because consumers are so active across digital channels patients are exposed to masses of health information online, meaning they are more informed about their health and treatment. They are able to access and contribute to numerous online forums and share their experiences of different treatments, enabling companies to listen to their market, as well as react to patient's experiences of their products. With new marketing channels come more opportunities to engage. Digital tools have not only allowed pharma companies to reach their customers, but speak to them on a more frequent basis and increase their visibility, as well as provide direct access to those in more remote areas. This enables sales teams to build enriched relationships with their customers, as they have the tools they need to develop a more personalised dialogue. The digital landscape has also allowed for greater information sharing, such as video content from KOLs (key opinion leaders), and community building on social platforms. This content breaks down complex information into easy-to-digest chunks, which not only increases the credibility of the company but adds value for the customer. Veeva is one of the tools that can be used to facilitate this digital dialogue using a cloud-based digital marketing platform specially designed for healthcare and pharmaceutical companies. Purple’s healthcare team have recently been certified to deliver 4 of Veeva’s specialist software solutions – Approved Email, CLM, CoBrowse, and Engage. Veeva is a fast and efficient way to create and deploy compliant marketing communications that have been medically and legally approved from a controlled asset store. The platform delivers this content to the sales force via mobile devices for real-time, interactive engagement or browser-based remote e-detailing. This comes as a welcome alternative to general print sales aids and enables more frequent updates and convenient access to content for customer meetings. In terms of data Veeva can provide rapid marketing information that can be fed back to marketers and sales reps, delivering insight into the way digital communications are received and engaged with. This closed loop marketing further drives marketing strategy and future communications and is an invaluable tool for field sales forces to deliver an improved and positive experience to HCP’s (health care professionals). Having already built a strong reputation and brand within the healthcare sector, Purple has experience of delivering specialist marketing solutions to healthcare and pharmaceutical companies. It is evident that digital programs and CLM are now an essential part of the healthcare marketers’ armoury. 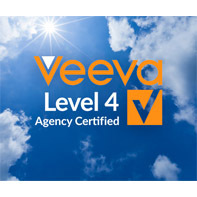 As 1 of only 10 pharmaceutical agencies in the UK certified to level 4, we can offer a gold standard Veeva service to existing clients, as well as other healthcare companies who have already invested in the system. We can exploit the full capabilities and recommend the best way to extract the most value, as well as provide consultancy and expert advice for digital delivery. Digital tools have obviously made an impact on healthcare marketing, opening a range of new communication channels and improving engagement. Platforms like Veeva are key to maximising the potential of these opportunities and offer pharmaceutical companies a compliant and effective way to optimise their digital communications. With a specialist healthcare marketing team, Purple not only offers expertise in ethical healthcare marketing, but also the tools to deliver best in class pharmaceutical digital marketing programmes. If you’d like to know more, or would like to talk to one of our team then get in touch, we’d love to hear from you!